When parents struggle with “what to make for dinner,” one tip I like to offer is to find a dish that everyone likes to eat when you go out, and try to make it at home. Fried rice, however, is a food that I thought I could never make at home. I don’t know why it seemed to be out of my cooking league and only something the family could enjoy on the three annual birthday trips to Benihana. But the last time we were there for Mr. Picky’s birthday, I watched in amazement at what it took for our chef to make fried rice — not a lot! I could make this at home! I took mental notes of what was used on the griddle — cold rice, beaten eggs, a few vegetables, soy sauce and a curious creamy spread our chef told me was “garlic butter.” Hmmm…..
Before I gave this a go at home, I needed to check around a bit to see if there was anything else I needed to know. It seems that fried rice is actually pretty straightforward provided you do one very important thing — use cold, cooked rice. Warnings abounded wherever I turned — one can never, ever, possibly even consider making fried rice with fresh rice otherwise you will have a mushy, disastrous mess. One thing you need to know about me is that I am a naysayer. Oh, really? Well I need to see it to believe it. And I that’s how I learned….never to use fresh rice when making fried rice because I’m here to tell you that you will indeed have a mushy, disastrous mess. 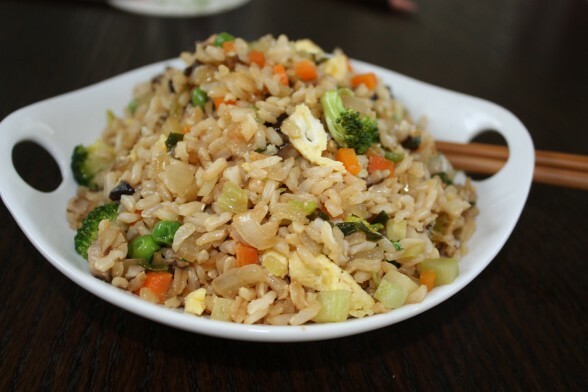 Fried rice is something that was invented in order to use up leftover rice and whatever bits of vegetables and meat you have from the night before. It is eaten as a snack in China, never as a meal. Don’t tell my kids, because they’re getting it as an entree. When you add scrambled eggs, peas, shiitake mushrooms and broccoli to long-grain brown rice, you have yourself plenty of protein. I often pack this the next day in a stainless thermos for the kids’ lunch and I have enjoyed it for breakfast as well. It is actually the perfect little meal with protein, good carbs, and some fat for stable blood sugar and long-lasting energy. Stir-frying anything requires all your chopping to be done in advance since things move so quickly. You can get this out of the way as early as the night before, if you want. 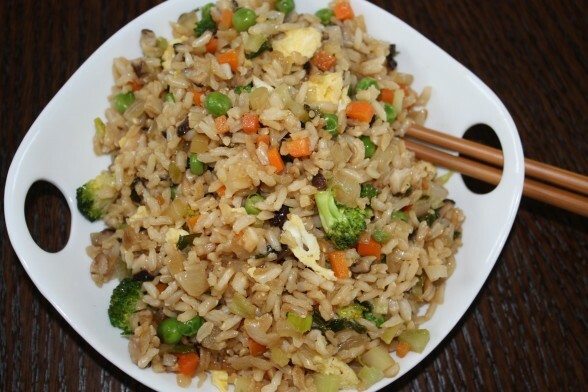 If you have leftover rice and all your vegetables are prepped ahead, fried rice can be cooked in minutes. Traditionally in China, the eggs are added with the rice so that the egg coats each grain of rice. I do it a little differently since Mr. Picky doesn’t enjoy eggs yet. I cook the beaten eggs in ghee (a clarified butter great for higher heat cooking) first and then remove them, chop them up and add them in at the end. That way Mr. Picky can pick out all the egg easily. You can really add whatever vegetables you have on hand and you certainly don’t need to use as many as I do. (The vegetables above were used in fried rice I made for a class where the recipe was doubled.) The key is to dice everything pretty small, about the size of peas, although the broccoli can be slightly larger. That way you can stir-fry them in the wok or pan and you don’t need to blanche them in a separate saucepan. I like washing dishes as much as Mr. Picky likes eggs. If your picky eater won’t go for brown rice, he’ll never know it here. The shoyu is going to change the color of the rice to brown anyway. To make this gluten-free, substitute wheat-free tamari and you’re all set. Vegans can drop the egg, use all sesame oil and still enjoy a high-protein dish. Don’t forget — Chinese New Year begins on February 3rd! Heat a wok or large sauté pan over medium-high heat. Add 1 Tablespoon ghee. Scramble the eggs in the pan until cooked through. Transfer the eggs to a cutting board and set aside. Add 1 Tablespoon sesame oil and 1 Tablespoon ghee to the wok. 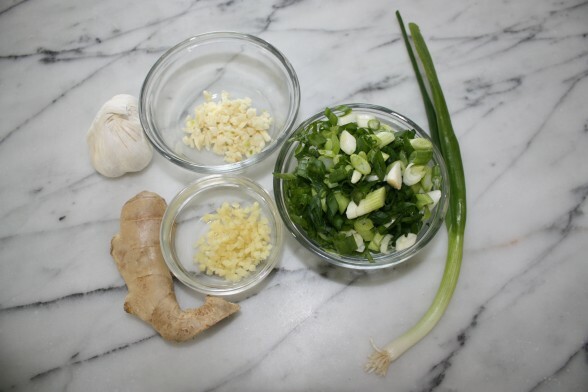 Saute the ginger, garlic and scallions until fragrant, about 1 minute. Add the vegetables and sauté until softened. Add the rice and shoyu and toss everything around in the wok until heated through. Chop up the cooked eggs and stir into the rice. Taste for seasoning and add additional shoyu or sesame oil, if desired. Sprinkle with sesame seeds for fun! 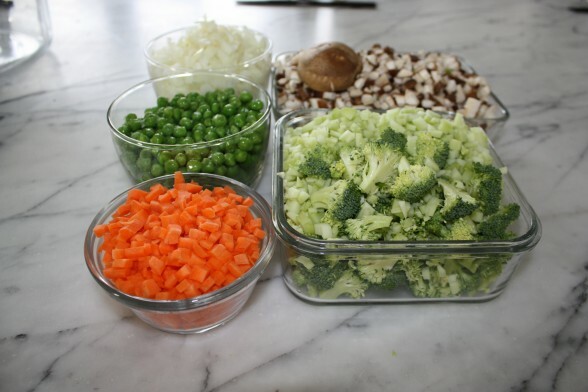 If you are using leftover cooked vegetables or meat, dice them up and add with the rice. I shared this recipe with Healthy Child, Healthy World! Sure, but try not to use too high heat since that can make the butter burn. Hi, Pamela! One quick question: Can we substitute tamari for the shoyu? Thanks! I have some leftover quinoa in my fridge – can I use that in place of the brown rice? Making this tonight! Thank you! Absolutely! Any leftover cooked grain works! will try this tonight! I am trying to watch saturated fats for my husband (who is in amazing shape but has high cholesterol for some reason) and am wondering about ghee…is it better than butter? can i use less? i normally do not cook with much if any butter. thanks! Ghee is a clarified butter, where the milk solids have been removed. So ghee is better than butter (and vegetable oils) for high heat cooking because it won’t burn and doesn’t get damaged from heat as easily. I love the flavor of a little butter with rice, but feel free to use an unrefined peanut oil or coconut oil if you have it and you don’t want to use ghee. I can’t wait to try this! I love fried rice, but was always kind of “intimidated” to try making it, but your recipe and suggestions make it sound very do-able, so Thank You for that! I Love brown rice and have pretty much given up eating white rice since I read that it has no nutritional value, but am on a very limited income and actually get lots of my food staples from food banks and they usually give lots of white rice. Also , I am very interested in trying the ghee as I’ve never heard of it….hope it isn’t too expensive! I only have time at my job for a quick meal (usually around 4 or 5 p.m.), and have been trying to come up with some foods that will provide me with some much needed protein and long-lasting energy to help me finish my shift…Thanks for taking the “fear” out of making fried rice! I’ll let you know how it works out for me…..Sincerely , MaryLou Stevens (P.S..I’m Kirby’s mom and she sent me your web site address and speaks very highly of ou so, thank you for exposing her to healthy ways to cook..and also “kid friendly” recipes as my 2 youngest grand-daughters are very picky eaters! Thanks for your comment, Mary Lou! One of the best things about fried rice is that you can use all leftover bits of vegetables and/or meat if that’s what you have on hand. Don’t worry about sticking to the proportions in the recipe — those are just guidelines. If you’re making this for your grandchildren, let them pick one or two vegetables that they would like to include in the dish and have them help you make it. Those are two ways that may encourage them to try something new. I will email you separately about everything else. Everyone in my family loved the fried rice! It’s delicious!! This will be a regular dinner item for us! This sounds amazing and I love that photo! Can you tell me a little more about “shoyu”? Is is soy sauce? Also, will any type of rice do for the fried rice recipe? Good questions! Shoyu is a naturally fermented soy sauce made from soybeans, wheat, water and sea salt. It has a richer flavor than chemically-processed soy sauces which often contain sugar, MSG or other additives. My favorite brand is Ohsawa, but you can use whatever you have on hand. And yes, you can use whatever leftover rice you have in the fridge. I prefer long-grain brown rice over white rice because it is more nutritious and the long-grain rice has less starch than short-grain rice. 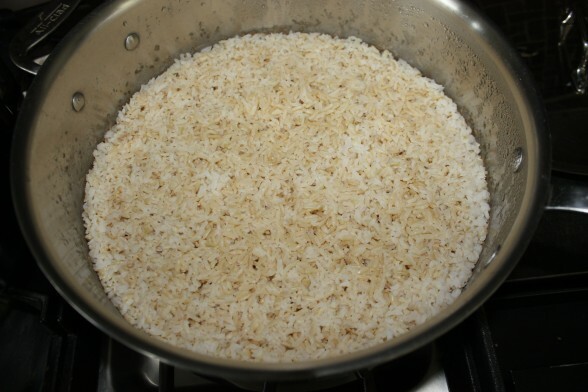 You can even mix different leftover rices, such as brown and white or basmati would be great, too. I heard from one of your students that your fried rice is quite delicious. I can’t wait to try it.